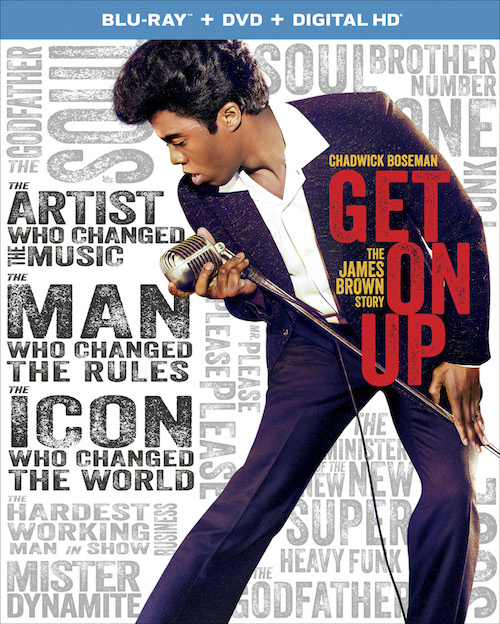 The brainchild of producer Brian Grazer and Mick Jagger, “Get On Up” does indeed have Brown’s catalogue. And they have a good Godfather of Soul too, played by “42’s” Chadwick Boseman, who is completely betrayed by a story that undercuts whatever expectations he’s trying to raise. Aging makeup looks him look goofy, and the story’s unholy jumble does his emotional work no service. Boseman is most distinct with his hustle, dancing his way through extended scenes, and rasping his voice, taking on another image of ego different than his memorable supporting turn as footballer Vontae Mack in 2014’s “Draft Day.” But even he has to deal with goofy lip syncing. Boseman takes on the “hardest working man in the room” title as a duty to save the entire show, not to make it worth watching. It is too bad that this movie played in theaters, as it is not very bathroom break friendly (but now you can pause it). “Get On Up” tries to shake things up by rearranging its narrative pieces, to create the illusion that this most certainly isn’t the serious version of “Walk Hard: The Dewey Cox Story,” but doesn’t succeed. Already with the burden of trying to contain a life in one script, the movie dashes forward and backwards to events in Brown’s life, but without a tonal consistency, the bigger picture lost. Instead of making the story funky, it is a horrific, boring mess. In presenting his life events, “Get On Up” has a bizarre aggression in making Brown as commodified to musical icon projection as possible, presenting him in a vacuum. There is little idea of a trajectory in his story, or of his cultural influence. But, we see that he indeed had problems with everyone, including the women in his life, and that he made his band members unhappy as well. One of the worst biopics in recent memory, “Get On Up” is remarkably without any passion considering the music that inspired its production. Taylor’s film is at best a failed attempt to sell Brown’s songs, as this one hits all the favorites with token emotional pit stops along the way. Instead, Brown comes off as a generic music icon, whose music is associated here with soulless lack of creativity. Synopsis: The life story of James Brown (Chadwick Boseman) AKA the Godfather of Soul. The film tracks Brown through different periods of his life, from his abusive beginnings in Augusta, Georgia, to the friendship that saved him from prison, to the days of rollicking audiences around the world. Featuring supporting performances of Viola Davis as Brown’s mother, Octavia Spencer as his caretaker, Craig Robinson as a member of his traveling band, and Allison Janey as a racist woman. ”Get On Up” was released on Blu-ray and DVD on January 6, 2015.